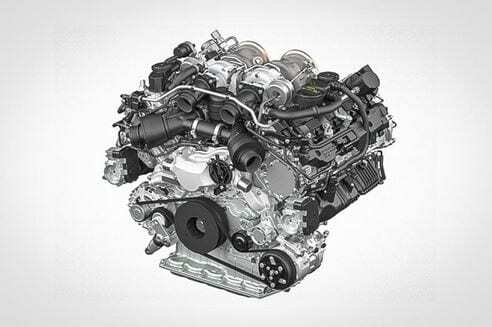 Porsche has revealed a new twin-turbocharged V8 petrol engine which is set to power future incarnations of its Panamera Turbo and Cayenne Turbo models. Originally revealed by Autocar last year, the 4.0-litre unit, which was unveiled in a low-key presentation at the Vienna Motor Symposium, will also feature in other Volkswagen Group models from Audi, Bentley and Lamborghini. It forms part of a modular range of V6 and V8 units developed in a joint venture between Porsche and Audi. The new Porsche engine shares its modular construction and various yet-to-be-detailed components with the turbocharged 3.0-litre V6 revealed by Audi in a new-generation S4 saloon at the Geneva show in March. With a perfectly square bore and stroke measurements of 86.0mm and 86.0mm, the new Porsche engine boasts a swept volume of 3996cm3. The unit used by today’s Panamera Turbo and Cayenne Turbo has 96.0mm and 83.0mm bore, plus stroke of 4806m3. Overall, this represents an 810cm3 reduction in capacity, allowing the future Panamera Turbo and Cayenne Turbo to sneak in under the 4.0-litre tax threshold in place in various markets, including China. With 542bhp at 5750rpm and 567lb ft produced between 1960rpm and 4500rpm, the new Porsche engine produces 29bhp more – and the same torque loading of 567lb ft – as the twin-turbocharged 4.8-litre V8 powerplant it replaces, albeit 250rpm and 290rpm lower in the rev range. This provides the new 90-degree V8, which uses 93mm cylinder spacing, with a specific output of 136.6bhp per litre – an increase of 29.9bhp per litre on its predecessor. Porsche officials suggest more powerful variants of the twin-turbo 4.0-litre unit destined for upcoming Panamera Turbo S and Cayenne Turbo S models are set to develop up to 600bhp and more than 600lb ft. Among the features included on the new engine is a cylinder deactivation system that closes down four cylinders between 950rpm and 3500rpm for a claimed 30% betterment in fuel economy. Porsche also says it has been engineered for use in hybrid applications, suggesting the new V8 could be coupled to an electric motor in selected models for even higher levels of performance. Porsche has also confirmed that the modular engine will be used in the Audi-developed MLB platform architecture as well as with its own MSB platform, the former supporting front and four-wheel drive and the latter rear and four-wheel drive. In the MLB application, it will be mated to an eight-speed automatic, while the MSB will see it combined with a new eight-speed dual-clutch automatic gearbox. The new Porsche-engineered V8 is also destined to power a wide range of models across the Volkswagen Group as part of a cost-cutting initiative aimed at amortising engine development and production costs. As well appearing in the new Porsche Panamera and Cayenne, the 4.0-litre unit is also expected to see service in the Audi A6, A8, Q7 and Q8, the Lamborghini Urus and the Bentley Bentayga and Continental.